We train over 50 educators every year in the Orton-Gillingham approach. Orton-Gillingham is one of the most proven language-based methods for teaching students with language-based learning disabilities, such as dyslexia, to read and write. This AOGPE-certified course consists of high-quality training in structured, multisensory language instruction. This practicum provides participants with the opportunity to work with an experienced Orton-Gillingham tutor through all aspects of a lesson. 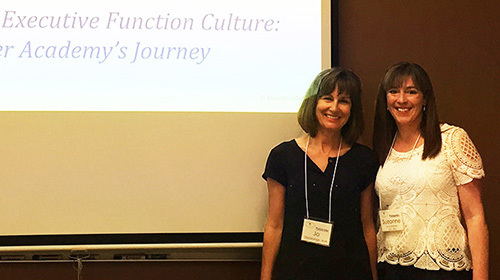 Our faculty present at multiple conferences throughout the year, including the IDA Annual Conference, ISABC Pro-D Conference, CAIS, CUEBC and Executive Function & Learning West Coast conferences, as well as the EdTechTeacher and GAFE (IOS & Google) Summits. If you are interested in having one of our expert staff present at your organization, contact us.